Ani: A Review - Hey, you guys like Star Wars jokes? 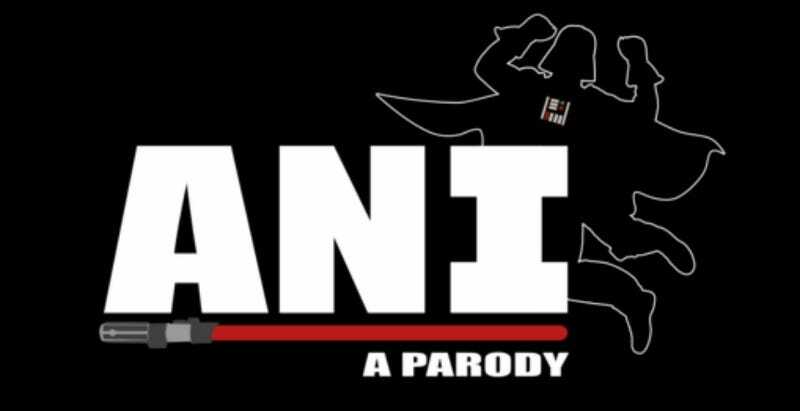 Last week Team Starkid, the group that gave the world A Very Potter Musical, Holy Musical B@man, and Twisted, unleashed their latest creation upon the world, Ani: A Parody. Ani casts Chris Allen as a past-his-prime Darth Vader (his friends call him "Ani"), bumbling around construction of the Death Star without anything to really do on it other than force choke those who criticize him or his religion, and longing for the good ol' days. Foregoing the style of last year's Twisted, which cast Jafar as the only sane man in the mad world of Aladdin to make the audience sympathetic with the character, Ani makes the character sympathetic simply by making him a bumbling, but endearing, buffoon. As Ani tries to recapture some of the glory of his past, he's crosses paths with other characters from the Star Wars universe, including Joe Walker as Grand Moff Tarkin, Denise Donovan as Mara Jade, Nick Lang as a hysterical take on an Alec-Guiness-era Obi-Wan, and several others. If you're at all familiar with Team Starkid, you should probably know what to expect from this by now. This is (depending on whether you count dramatic readings like A Very Potter Senior Year, which I do) their eighth play since 2009, so their brand of affectionate parody is nothing out of left field. That's not a problem though. I've been a fan of Starkid since A Very Potter Musical, and, minor missteps aside (I just don't like A Very Potter Sequel, sorry), I've enjoyed and respected everything they've produced. Much like with their other parodies, you can tell that despite the whole thing existing to poke fun at the Star Wars canon, everyone involved has a real love for the source material. A lot of the jokes here wouldn't have been put in if those writing it didn't have a fairly deep knowledge of Star Wars, at least enough to know who characters like "Mara Jade" or "Salacious Crumb" are, and there are moments where they poke as much fun at themselves for caring so much about a simple film franchise as they do at Star Wars for including some pretty silly stuff at times (especially in the prequels, of course). Unfortunately, Ani is ultimately one of the most flawed Starkid musicals. The biggest problem I had with the production is the way the music is handled. Unlike the other Starkid musicals, this one forgoes having the actual actors sing, instead having a band onstage performing all the music, while the characters dance. This does lead to some very funny fourth wall acknowledgements here and there, but I'd have preferred seeing more traditional musical numbers. The music itself was fine, going for a synth-ey style similar to Holy Musical B@man as opposed to Starkid's typical Disney-inspired fare, but with the exception of one or two songs (the opening number, "Ani," being one of them, and quite an earworm at that) none of the songs seemed especially compelling. If you've followed Starkid's productions in the past, another thing you'll notice is that this one is really small scale compared to some of their previous work. It may be hard to compare the show to last year's Twisted, which had stellar production work, great sets, and wonderfully made costumes, since that one was a successful Kickstarter project which gave them a bigger budget than Ani could manage, but even compared to some of their early work like Holy Musical B@man or Starship, the whole thing simply feels small scale, with only one real set, mostly cheap-looking costumes, and few props (with a lot of the action being mimed out). That's not inherently a problem, A Very Potter Musical still holds up fairly well and it looks like it was produced on a handful of Cheetos and a prayer, but when you take into account that Starkid had two productions this year, with the other being the (still unreleased) Trail to Oregon, it raises the question whether splitting production money was something that paid off. Until I've seen The Trail to Oregon, I can't say for sure, if it's funny then I think it was definitely a good choice, but it still doesn't help Ani escape the shadow of its predecessors. On the story side, Ani also rings a little hollow. One thing that's always helped the Starkid parodies work well on their own merits is that, despite being absurd in their own way, they manage to tell stories that usually feel pretty genuine. The version of Batman they created in Holy Musical B@man was ridiculous, but it was still actually heartwarming in a weird way to see him find a friend over the course of the story. One of the things that worked best about last year's Twisted was how they managed to take Jafar, one of the least naunced villains in Disney history, and spin a great story around him. Ani just doesn't feel like it works on that level. There's a story here about a has-been trying to make a comeback, but the characters all ring kind of hollow, and the story ultimately isn't compelling enough to really make me care. There's no one moment that makes me say "this is where this play all comes together," and the others have had that. I can point to a specific moment in A Very Potter Musical where it works as its own thing. I can point to a moment in Twisted where it works as its own thing. I can't point to a particular moment in Ani and say "here, even if all the Star Wars trimmings were cut out, this musical would work on it's own merits because of this moment." With all of those negatives said, though, Ani is funny, and that's enough. It's not perfect, there are jokes that fall flat (and, again, I think some of Starkid's weakest moments are when they go blue with their humor only for the sake of going blue), but a lot more jokes hit than miss, and if you're a fan of both Star Wars, and cheesy absurd humor, Ani will probably keep you grinning like an idiot through most of it. The only reason I'm so harsh on Ani is that I know Starkid can do better. I like Ani. I have problems with Ani, but I still like Ani. Heck, it was funny enough that I'll probably watch it a second time. It's not where I would recommend entering the Starkid library of work, I'd recommend A Very Potter Senior Year, Holy Musical B@man, or Twisted over this, but it is definitely funny enough to warrant the two hour run time. Hilarious performances, funny jokes, and the sheer absurdity of seeing Darth Vader cast as a bumbling idiot make this worth a watch. Plus, as with all the other Starkid musicals, it's been made available for free on YouTube, so, hey, go give it a shot. If Star Wars jokes are your thing, it's a pretty good time.